The International Aids Society's 2014 conference continues in Melbourne after six delegates, including a former president, have been lost on the Malaysia Airlines crash in Ukraine. The International aids community is mourning the loss of former president Joep Lange, who was travelling with his partner on the MH17 Malaysia Airlines flight for Aids 2014, the society's biennial conference, when the plane was allegedly shot down over eastern Ukraine. Also on board were six delegates (early reports suggested it was as high as 108), including a British World Health Organisation (WHO) staff member, who were travelling to the six-day conference at the Melbourne Convention and Exhibition Centre (MCEC). "The extent of our loss is hard to comprehend or express," said President of the IAS, Francoise Barre-Sinoussi. "We grieve alongside all of those throughout the world who have lost friends and family in this senseless tragedy." "Our colleagues were traveling because of their dedication to bringing an end to AIDS," said Owen Ryan, Executive Director of the International AIDS Society. "We will honour their commitment and keep them in our hearts as we begin our program on Sunday." The International Aids Society's 12,000-strong conference runs from 20-25 July, with speakers including Bill Clinton and Sir Bob Geldof. In a statement, it said: "In recognition of our colleagues' dedication to the fight against HIV/AIDS, the conference will go ahead as planned and will include opportunities to reflect and remember those we have lost." Visit Melbourne announced on Twitter that it has cancelled a fireworks display that was due to take place at Melbourne Docklands on the opening night "in light of the tragic loss of live on #MH17". The opening ceremony at Melbourne's Hamer Hall arts centre has been described by one delegate on Twitter as "sombre but powerful". 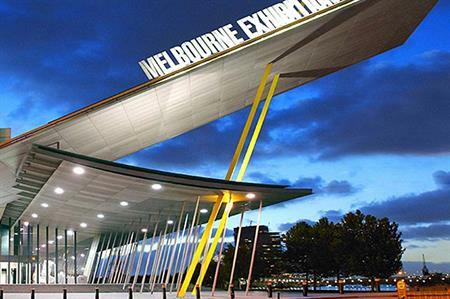 Linda Gaunt, CEO of Meetings & Events Australia, a national industry body for business events, said: "It is incredibly sad to realise that the world can no longer safely meet, conference, learn from each other and grow expertise. On behalf of Meetings & Events Australia I offer my sincerest condolences to the Malaysian airline victims and their families."